Before Christmas I posted about the “porch cats” who have been visiting our house. We have been spending a lot of time watching, feeding, and setting up shelters for a group of apparently homeless/stray/feral cats. Some of them seem truly feral (e.g. : they run away if we even look at them from a distance), some of them are a lot more used to human company. 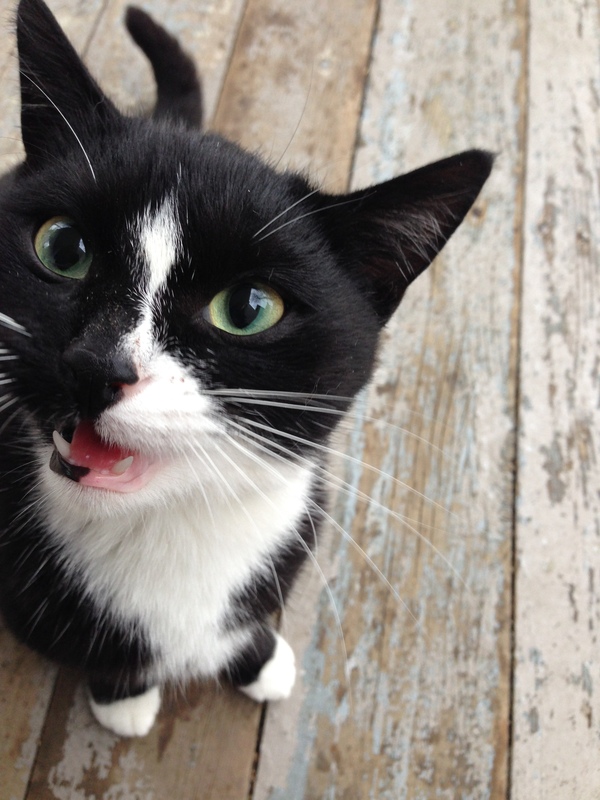 The one little black and white cat we named Ollie has been especially communicative with us. She would arrive on our porch each morning between 6:30 and 7am and would sit on our “welcome mat” by the door meowing for her breakfast. When the cold snap hit last week Ollie seemed to be making an extra effort to communicate with us – she meowed a little longer and louder than she had before and didn’t leave the porch immediately after breakfast like she usually did. She started to hang around more and more. One day after we had received a large amount of snow I looked outside to see little Ollie up to her armpits in a snowbank in our garden, meowing her head off. She seemed stuck and was having trouble getting out of the snowbank. I pulled on my boots and went out to grab her – I didn’t really have a plan, but I knew I couldn’t leave her out there to freeze to death in a snowbank in our garden. I brought her in the house and took her down to the basement because I wanted to keep her separate from our house cats. At first she completely freaked out – I’m sure she has never been in a house before – but she slowly started to settle down and found a warm, comfortable spot to curl up in. Within a few days she was sitting on my lap purring when I came to visit her. Part of me knows that I couldn’t leave her out in the cold, and yet there is a part of me that feels so bad for scooping her up and taking her away from her pals. Did we do the right thing? We took Ollie in to the community vet clinic the other day and had her checked out. She had fleas, but otherwise she seemed in good health. She got the standard deworm/de-flea/vaccination treatment and we will book her in for a spay soon. I’m not sure what will happen long-term, whether or not Jenny (our senior kitty who hates cats) will let us keep her, but we have some leads one some potential homes for her if things don’t work out. The rest of the porch cats are still out there – they won’t let us get near them. We didn’t see much of them during the cold snap, but since it has warmed up they have been back around for food and have been using the shelters I’ve set up on the front porch. I was so worried about them and was so glad to see them when they all showed up yesterday. There are so many cats in need, so much work to do. Sometimes I get overwhelmed just thinking about it. I guess it is one cat at a time. A number of kind and generous people have come forward to help out with the food for our porch kitties since I first posted about them. We are so grateful for your assistance, and I know that the cats appreciate the food. I get so sad thinking about all these cats with no loving, warm home to curl up in, but then I am heartened by how many people truly want to help change the situation. Thank you.